Activities for Cinco de Mayo parties should be reflective of the culture that you are celebrating as well as fun. From crafts to dancing to celebrating with Mexican music, a Cinco de Mayo party is certainly a highlight on the calendar each spring. Cinco de Mayo is meant to be a joyous celebration of heritage, family, friends, and overcoming unbeatable odds. Keep that in mind when you're planning activities for Cinco de Mayo. Make sure to find the traditional version of the Mexican Hat Dance as well. 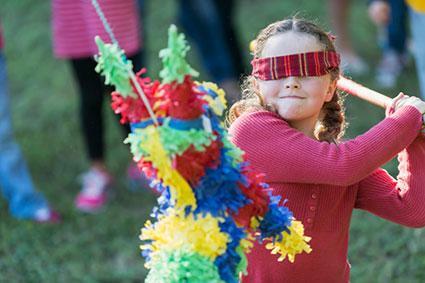 Piñatas are very much a part of Mexican culture. These paper mâché treats are most often filled with candy, but can also be filled with small toys. Children love to bat at the swinging sculpture to see who will break it open first. While there are a variety of shapes and sizes to choose from, the traditional Mexican Cinco de Mayo piñata is in the shape of a donkey. If you can't find a donkey-shaped piñata don't worry; something with brightly colored tissue paper in yellow, green, and red will still look appropriately festive. Kids on the receiving end of the piñata's goodies will certainly not care. Making traditional tortillas not only adds to the authenticity of your party but can really make for an interesting gathering. Making tortillas from scratch is not that difficult and is always a hit with children especially since it involves getting a little messy. Before your party, check out The Well-Filled Tortilla Cookbook for types of tortillas, techniques, and ideas for fillings. Kids will love the opportunity to get their hands "dirty", mixing and patting down the tortilla mixture. Using Model Magic in terra cotta colors, or other air-dried clay, allow guests to make coil bowls to take home as party favors. To make a coil bowl, roll out the clay in a long "rope". Coil the rope around its end until you run out of clay. Form the bowl by smudging the sides together. To make a deeper bowl, you can simply attach another rope to the end of your first clay rope by pinching the ends together. Bake according to the directions on the clay. Instead of playing "Pin the Tail on the Donkey", you can play "Pin the Sombrero on the Burro". Fill a jar with Mexican jumping beans (red kidney beans) and have guests guess the number of beans in the jar. Play "Hot Chili Pepper" in lieu of "Hot Potato". Play "Juan Dice" to replace the classic of "Simon Says". About Cinco de Mayo Cinco de Mayo, meaning the "fifth of May" in Spanish, is often (and mistakenly) referred to as "Mexican Independence Day". However, Cinco de Mayo is actually a day that commemorates the Battle of Puebla in which the Mexican army defeated a much better organized and better equipped French army. Despite its historic roots, celebrating Cinco de Mayo has really become about celebrating Mexican heritage more so than about celebrating a military victory. Observing Cinco de Mayo is a fun way to learn about and share Mexican culture.